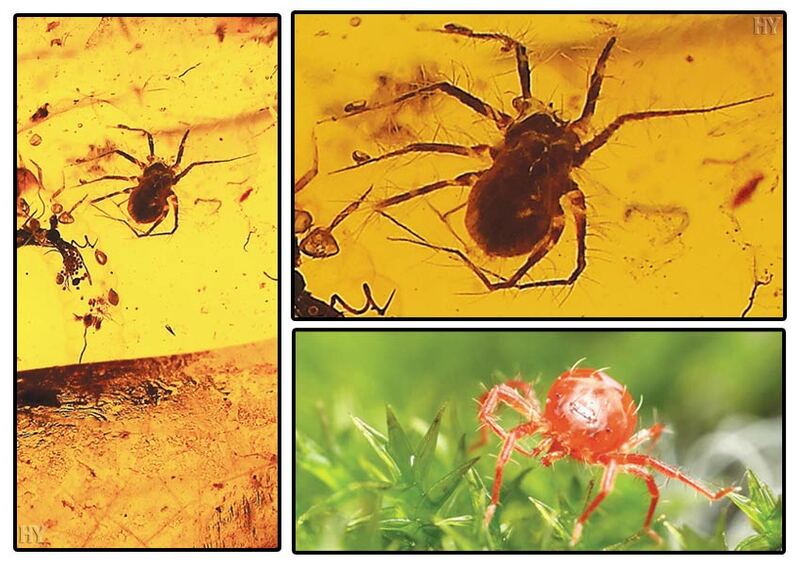 The spider mite in the picture is identical to specimens living today and has never changed in any way. If life forms evolved, as the evolutionists maintain, then the whole world should be covered in the fossil remains of exceedingly pathological living things. There should be millions of transitional fossils of millions of pathological life forms with legs growing out of their heads, with feet on their stomachs or maybe stomachs on their feet, perhaps with one eye on their foreheads or tails sticking out of their heads. On the contrary, the fact that fossils dating back millions of years are identical to specimens living today proves that they never changed, and that species are not descended from one another by way of evolution. The 350 million or so fossils unearthed have revealed that species are not descended from one another and that they never evolved. 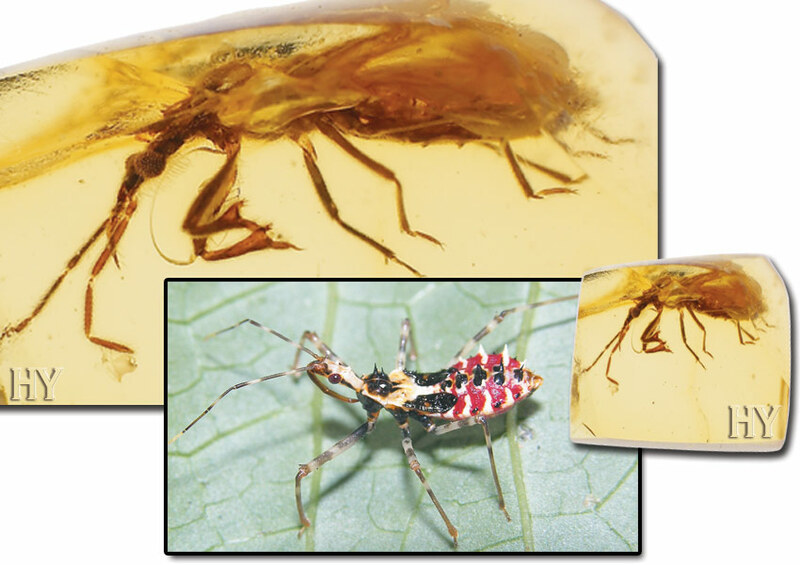 The assassin bug, as seen in the 100-million-year-old fossil above has come down to us completely unchanged to the present day. The fact that Darwinists still maintain that evolution took place, despite seeing millions of fossils that have never changed, clearly shows they are under a kind of magic spell of belief in this dogma. But the evolutionists’ endeavors have all been in vain, and 21st century paleontology has spelled the end of the theory of evolution. Thrips are arthropods from the order Thysanoptera, meaning ‘fringed wings.’ They are generally red, black or yellowish in color. 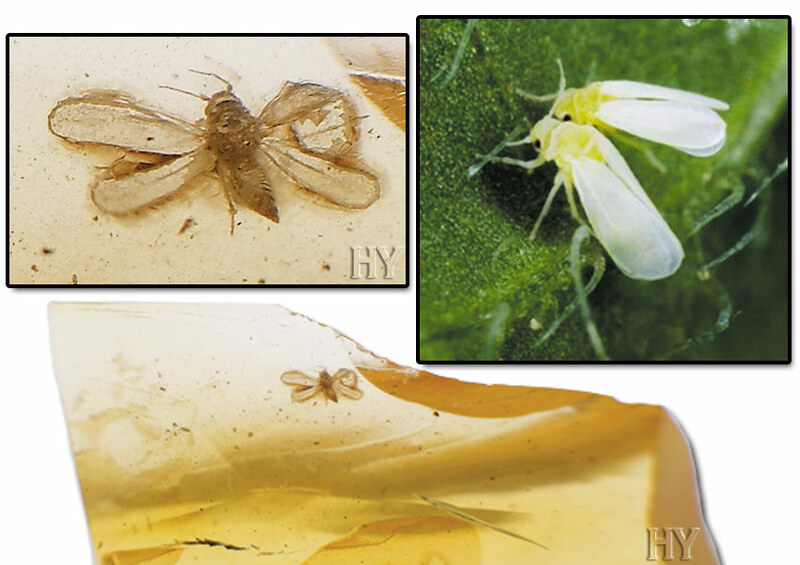 Thrips fossilized in amber have been preserved in the ideal environment and show us that they have never altered. 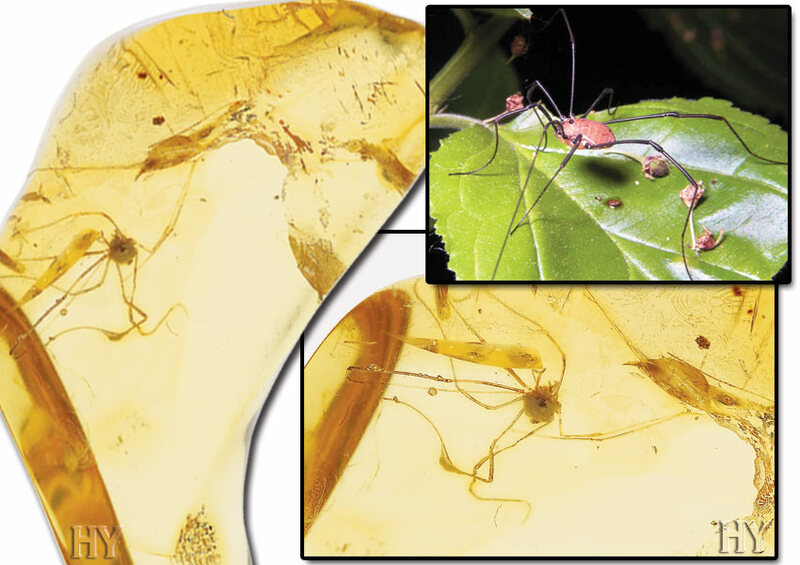 The thrip fossil in, the picture, preserved in Burmese amber for 100 million years, proves that thrips, like all living things, never evolved. Anobia are small, harmful winged insects from the family Anobiidae. They can live for a year without feeding. These sturdy insects are found in many regions of the world. 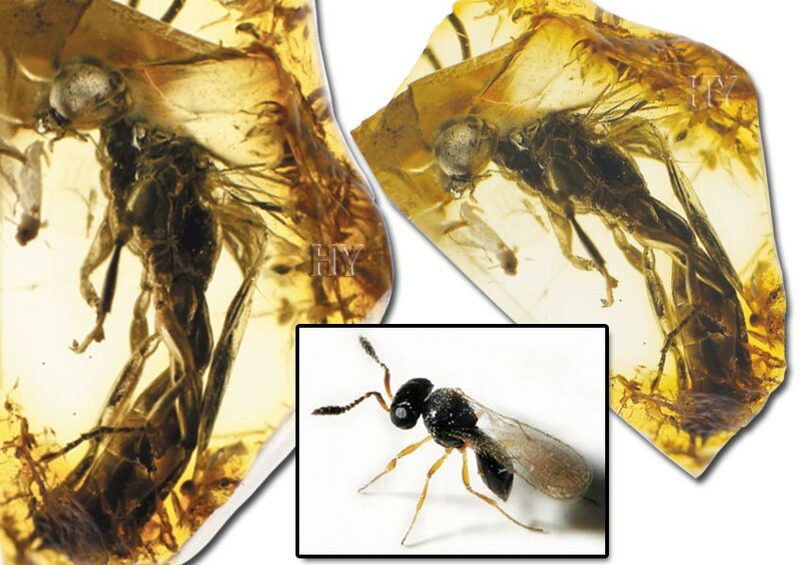 The anobium in the picture was imprisoned in amber in Poland 50 million years ago and has been preserved down to the present day. This specimen also shows that living things have never altered and never evolved. 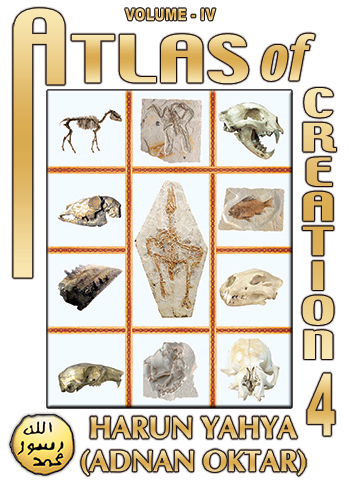 Fossils demonstrate the sublime intellect, artistry and might in Allah’s creation and prove what an insoluble dilemma the adherents of evolution find themselves in. 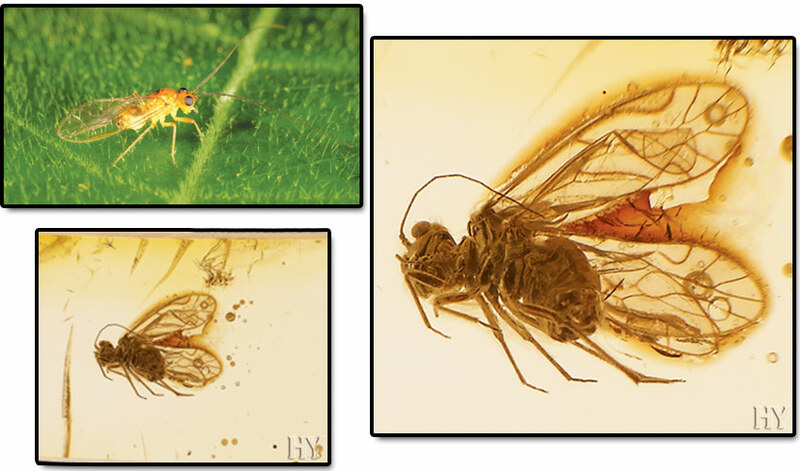 These flies, from the family Tipulidae, have long thin bodies, like those of mosquitoes. They do not spread disease, but they are regarded as pests by people engaged in agriculture. The female of the species lays her eggs among plants. The larvae that hatch settle inside the soil and feed on the plant roots, thus doing great damage to vegetable gardens and planted crops. Crane flies are common in the fall, in humid places and along the sides of rivers. 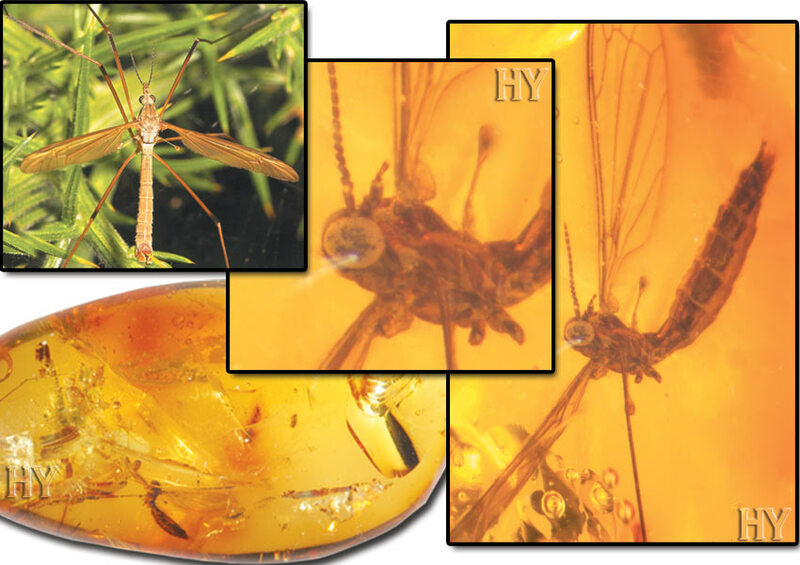 There is no difference between this 100-million-year-old fossil crane fly in the picture and crane flies living today. This is Allah's creative artistry. Our Almighty Lord Allah is One, and there is no other Creator than Him. Looking at the life forms that have existed throughout the course of history, we see that they continued unchanged from the moment they were first created. 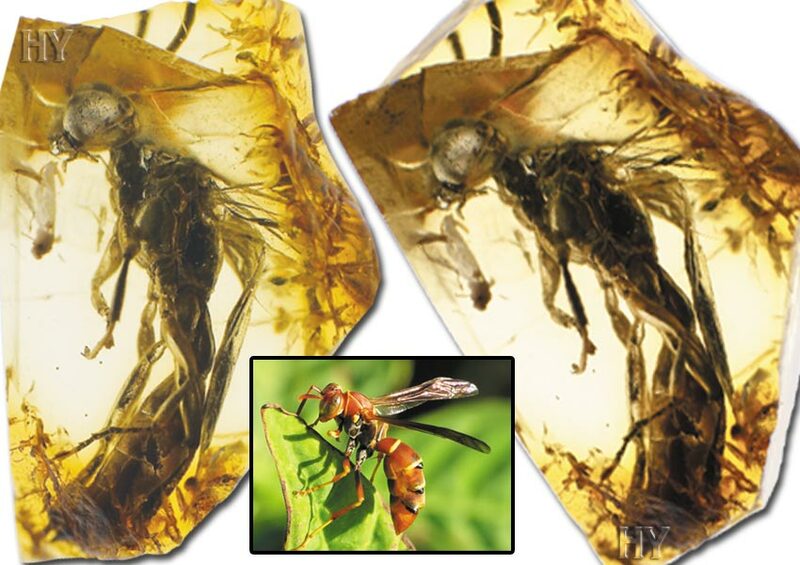 This 50-million-year-old wasp is proof that living things never evolved and had the same characteristics millions of years ago as they do today. White flies are not actually classified as flies, though they resemble them, hence the name. They are also regarded as agricultural pests. These tiny animals have had the same features ever since the day they were first created. The 50-million-year-old white fly in the picture proves that these animals never changed. Allah has created all life forms from nothing. Recent scientific research into ants has shown that these tiny creatures possess an amazing communications system through some 500,000 nerve cells squeezed into bodies just two to three mm (0.079 inches) in length. There are some 14,000 known species of ant and each has its own unique and astonishing characteristics. Neither these animals’ anatomical structures nor their social lives have changed since the day they were created. 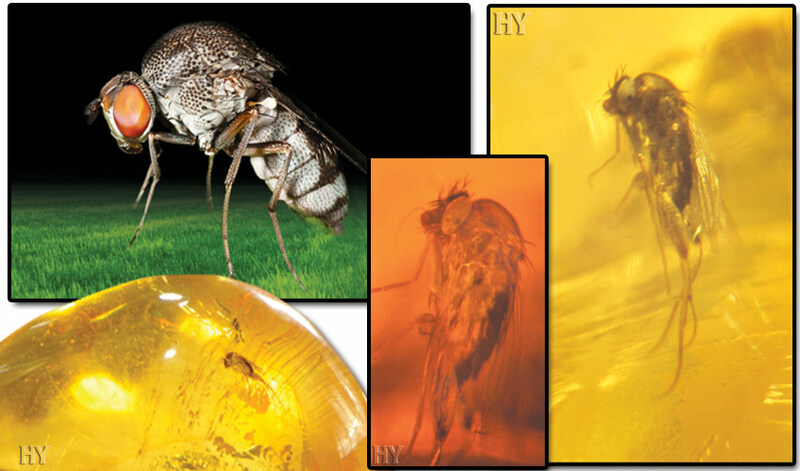 Amber provides the perfect setting for small organisms to be fossilized unharmed. 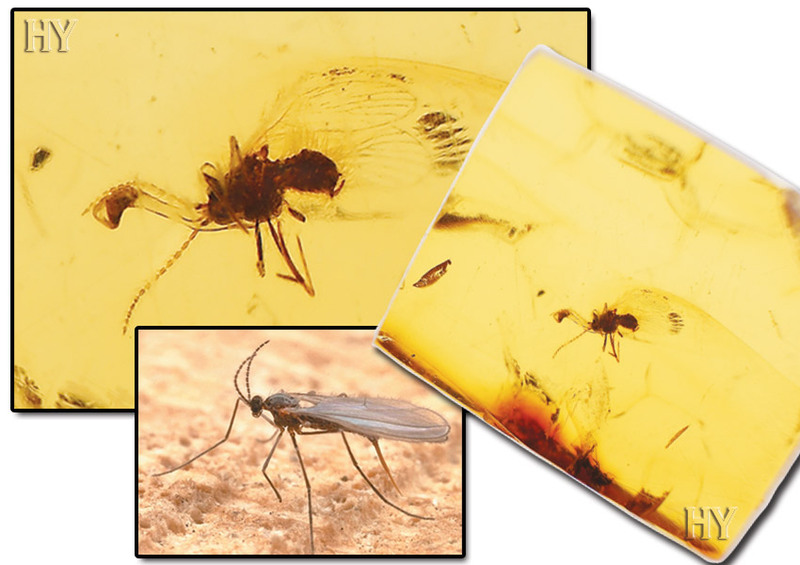 The aphid and termite wing in this 50-million-year-old fossil prove that no organ or body part of any life form has ever changed and that every life form has come down fully formed and with the same perfection from the day it was created to the present. That being the case, there is of course no question of any evolution taking place. 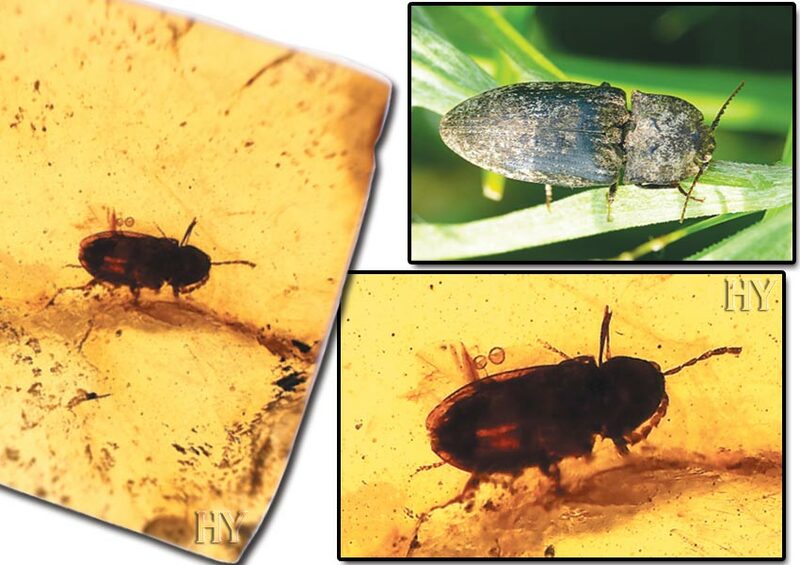 The 50-million-year-old psocid fossil in the picture proves that psocids have existed unchanged for millions of years. One of the most important features of fossil findings is that life forms never change in the fossil record throughout the periods in which they existed. In other words, a life form remains the same, from the form in which it first appears in the fossil record until the disappearance of that life form, over tens or even hundreds of millions of years. The meaning of this is obvious; evolution does not exist. 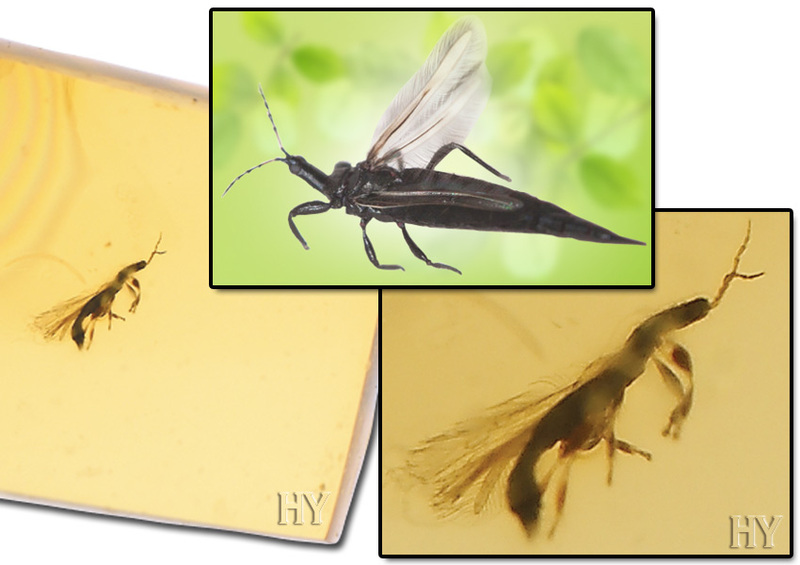 One life form that has survived unchanged for millions of years is the fungus gnat. 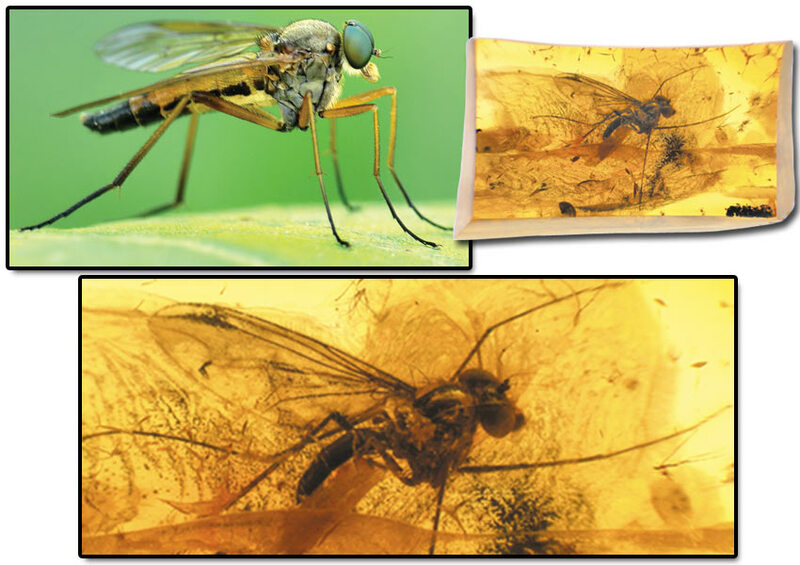 The picture shows a 100-million-year-old fungus gnat specimen. 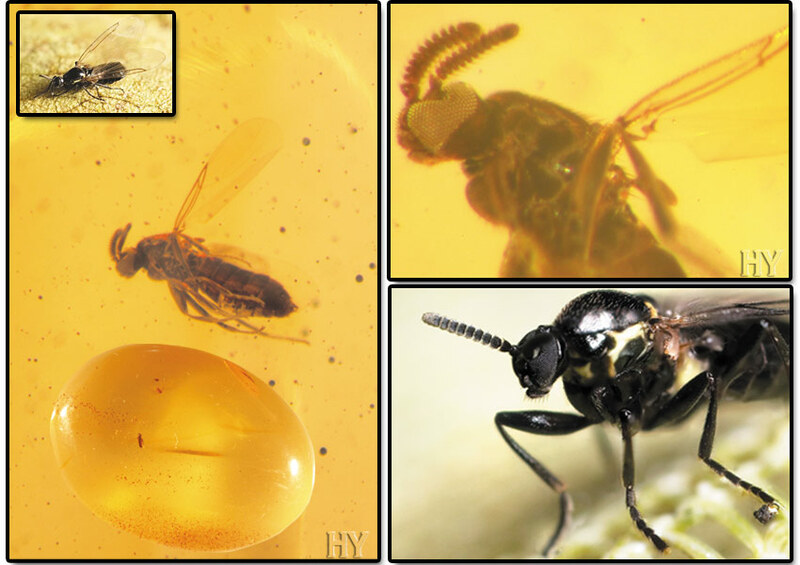 The way that the compound eye of a 25-million-year-old minute black scavenger fly preserved in amber has survived completely undamaged is literally a miracle. The presence of thousands of lenses in the eye and a brain system capable of interpreting what it sees reveals an immaculate creation. Life forms with such eyes, whose perfect arrangement make them marvels of engineering, have been around for 390 million years. That same complex compound eye structure can be seen in trilobites that lived in the Cambrian Period, 530 million years ago. The eye, an exceedingly complex organ, is one of the subjects that evolutionists are most reluctant to discuss and that demolishes their theories. The way that all these lenses combine their images into one single image shows the sublime nature of Allah’s creative artistry. For a scavenger fly that lived millions of years ago to possess such a complex organ shows that Allah created it with a wondrous artistry. 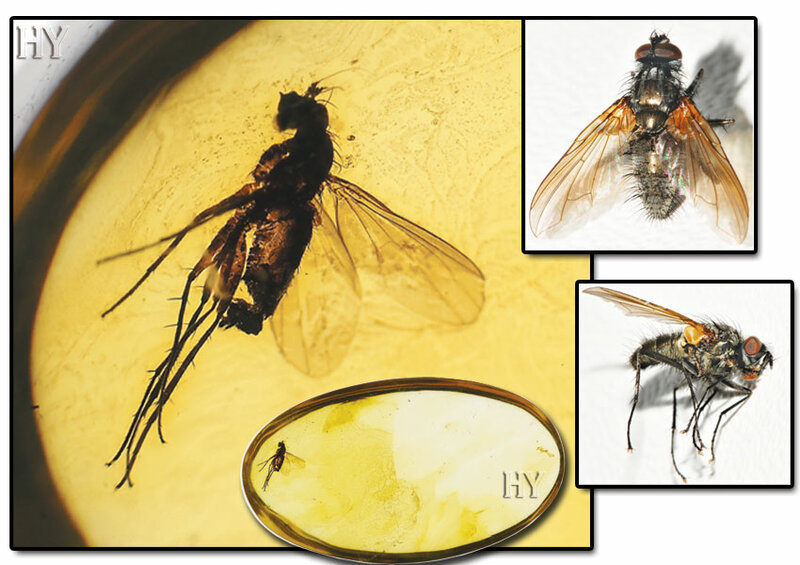 The humpbacked fly that lived 25 million years ago, shown in the picture, is one of the life forms whose origins evolutionists admit they cannot account for. In claiming that dinosaurs turned into birds, evolutionists maintain that some dinosaurs “...grew wings and took to the air” as they beat their front legs while chasing after insects. This theory, a totally imaginary one with no scientific basis, also contains a facile and circular logic; that is because the example that evolutionists use to explain the origin of flight, the fly, already possessed a perfect flying ability. While no human being can flap his arms even 10 times a second, some flies manage to beat their wings an average of 1,000 times per second. In addition, flies beat their two wings simultaneously. The slightest imbalance in the timing would mean the fly losing its equilibrium. But this never happens. 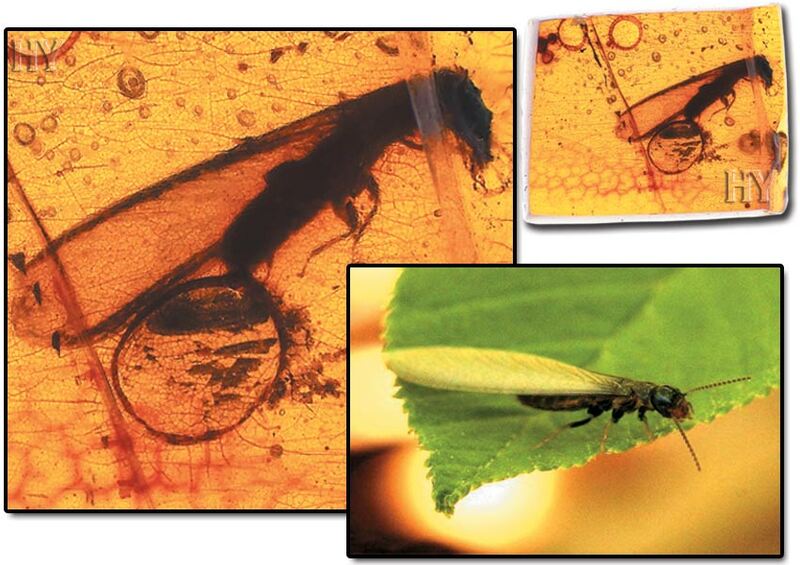 Even a tiny fly fossil is clear evidence that evolution never happened. The theory of evolution consists of an imaginary tale regarding the natural history of living things, but it is also refuted by all scientific discoveries in that sphere. Living fossils show that the effect of the environment is not “evolution,” but rather “non-evolution.” Species did not acquire their present-day anatomies through some random change. They were all brought into being by Allah, in a moment and flawlessly, and all lived exactly as they were first created throughout their time in the world. These tiny animals, from the family Cecidomyiidae, are known for causing galls in plants. Galls are abnormalities resulting from injury to the plant tissue. The larvae feed on numerous plant tissues in which galls then develop. There has never been the slightest change in either the anatomical structure or lifestyle and ways of feeding of any life forms there have ever been. 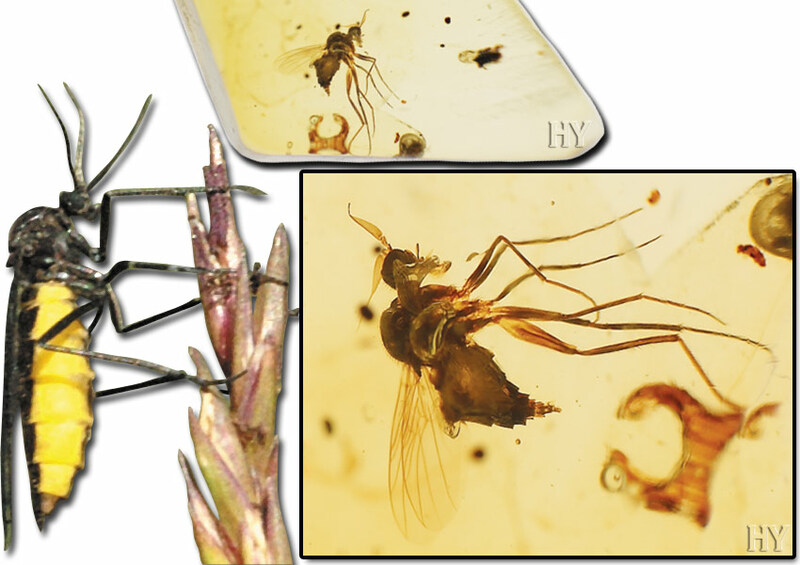 The 100-million-year-old gall midge in the picture is just one of the proofs of this. There are some 177 separate families of these flies, members of the sub-order Brachycera. Not one single finding has been unearthed to date in the fossil record to show that these species of fly underwent evolution. Allah created all life forms with no imperfections. This beetle performs a somersault to right itself after being turned over on its back. It is a member of the family Elateridae (Coleoptera). When upside down it generally remains still, pretending to be dead. Click beetles vary between 12 and 30 mm (a half to three quarters of an inch) in length. 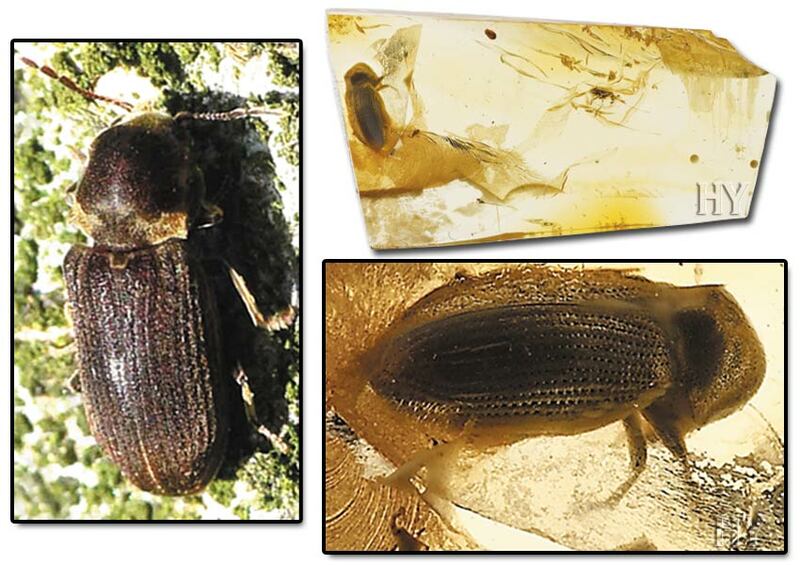 The 100-miilion-year-old click beetle in the pictures has exactly the same features as specimens living today, and it lived in the same way as them. It employs the techniques it does, not through evolution, but in the manner inspired by Allah. Allah is He Who creates all life forms with different attributes. Thrips is the common name given to arthropods from the order Thysanoptera. They range from 0.5-10 mm (0.020 to 0.40 inches) in length. 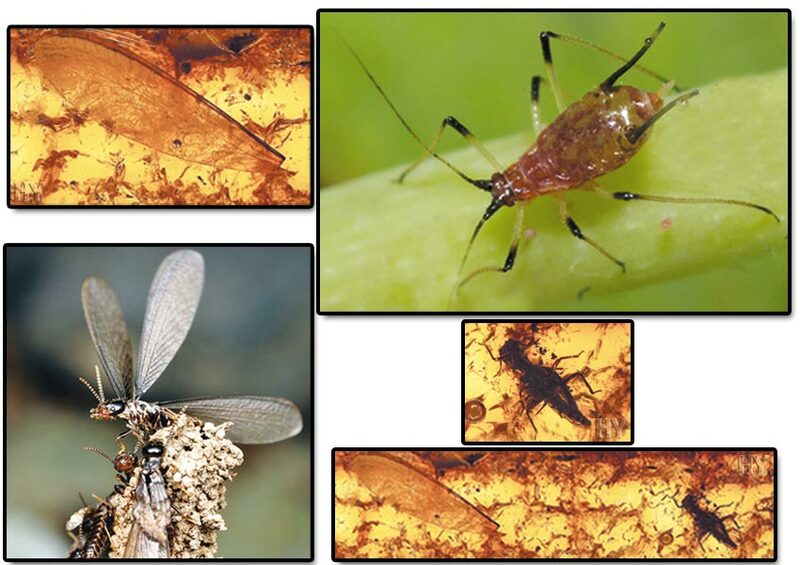 There is no difference between a 100-million-year-old thrip and thrips living today. 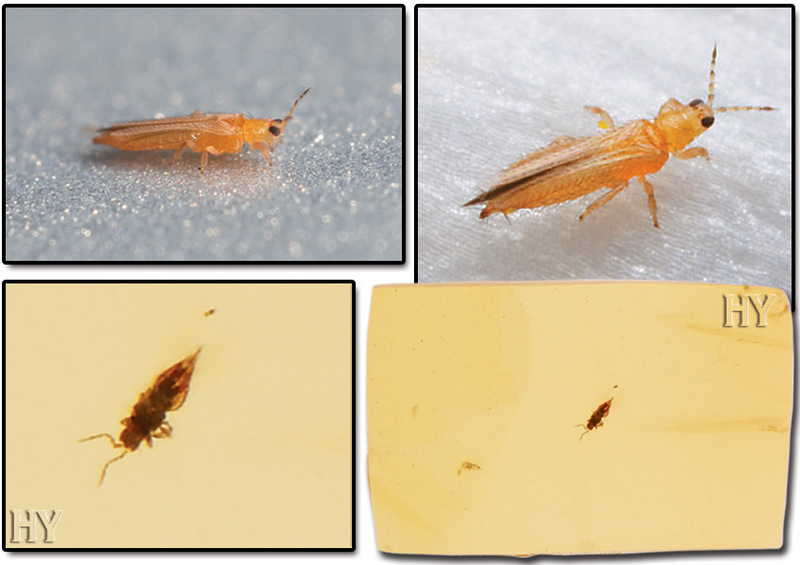 This thrips that were living 100 million years in the past had the same body, wings and antennae as present-day specimens. This is one of the proofs that, like other life forms, thrips did not evolve. It is Allah, Who knows how to create in all ways, Who creates thrips and bestows their characteristics on them. Termites inhabit tropical regions in particular and establish magnificent colonies in towers made from mud that can reach up to four to five meters (13 to 16 feet) in height. The architecture within these miniature cities is constructed so as to ensure constant adaptation to changing climatic conditions. The cities built by termites, which belong to the order Isoptera, are flawless, not just in social terms, but in respect of the arrangement in them. 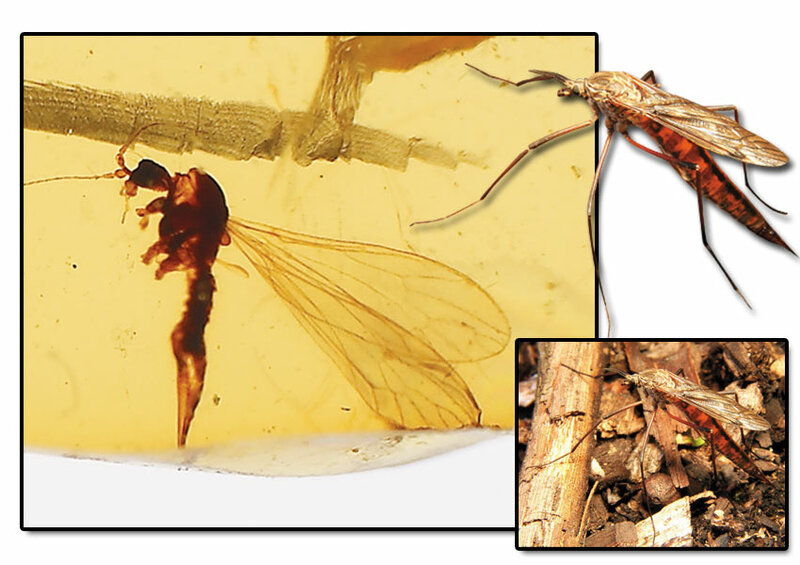 The 100-million-year-old fossil termite in the picture is proof that these living things never evolved. These creatures, some of which are poisonous, are generally to be found in rural and wooded areas all over the world. They belong to the class Chilopoda from the phylum Myriapoda and have never altered in any way from the day they were created to the present. 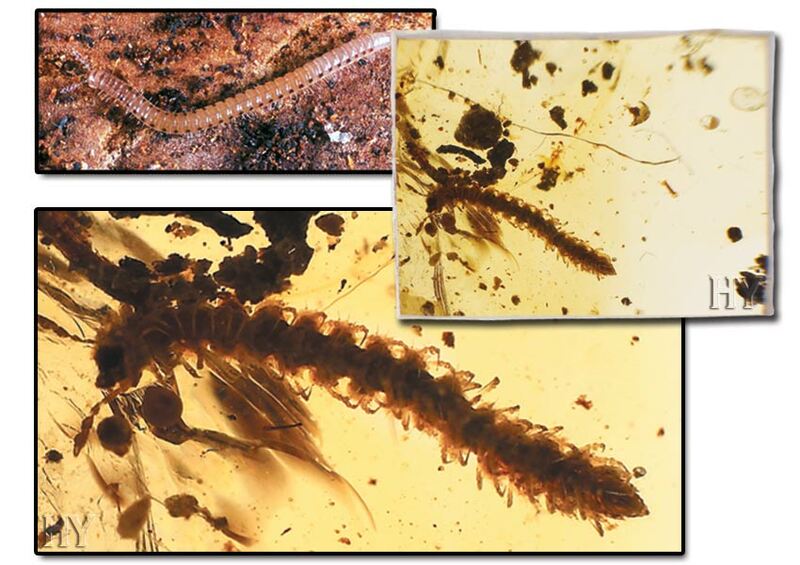 The 100-million-year-old fossil centipede in the picture is proof that these animals never evolved. Lightning bugs are miraculous life forms capable of manufacturing their own light. Light is essential for human life. Human beings experimented with various different means of obtaining light down the ages. The lightning bug is able to produce a maximum level of this cold light in its own body, without the use of any chemical substances from the outside, and with no information or previous experience. Scientists have for years been researching and seeking to produce light as efficiently as that manufactured by lightning bugs. These animals obtain almost maximum efficiency and lose almost no energy at all in producing light, and these characteristics have been the subject of research for years. Allah has created such perfect features in living things, and has made them models for human beings. One of the wisest aspects in Almighty Allah's creation of details is that it makes people think. 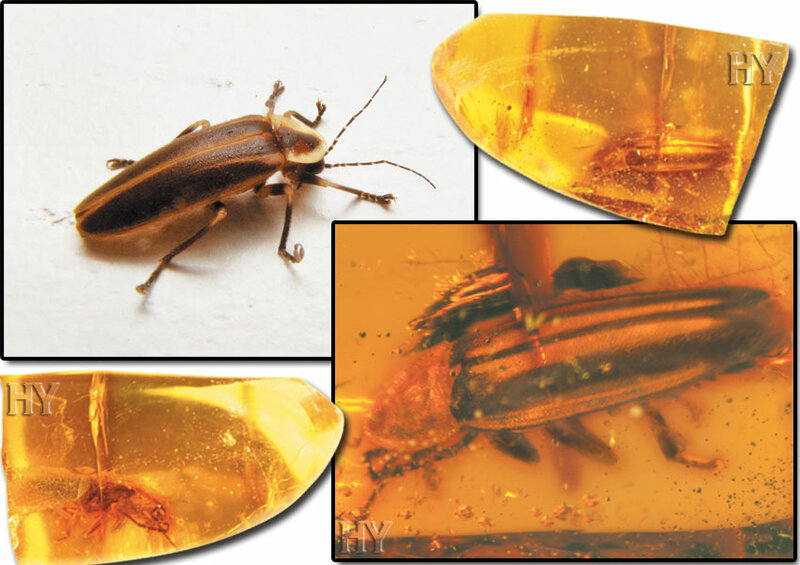 This 25-million-year-old lightning bug fossil proved that life forms have had immaculate characteristics ever since the moment they were first created, that they have remained unchanged for 25 million years and that they never, as Darwinists maintain, evolved. Like all other life forms, these creatures, members of the sub-order Oniscoidea, have come down unchanged to the present day. Had the evolutionary stages that evolutionists claim took place really done so, then the transitional stages that life forms went through would certainly appear in the fossil record. 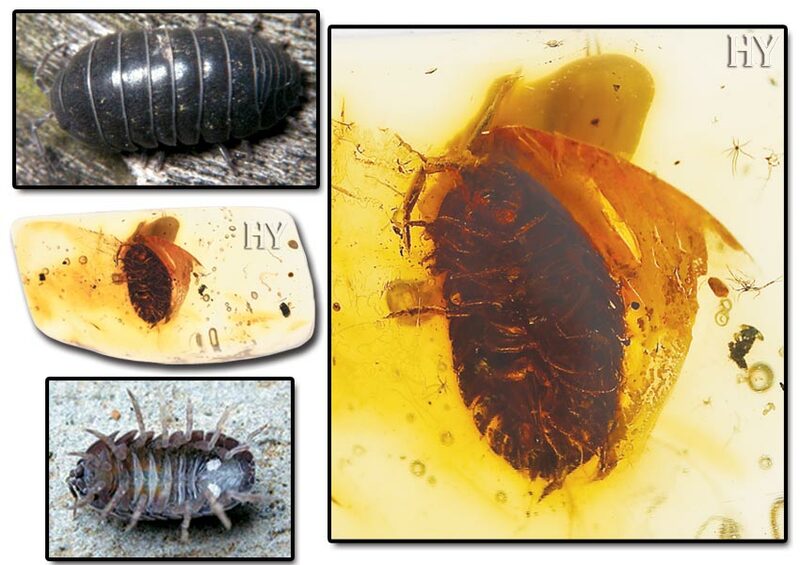 But as can be seen from this 45-million-year-old fossil isopod, no living things ever underwent evolution at all. These arthropods that range between 2 and 22 mm (0.079 to 0.9 inches) in size, have eight legs, just like spiders, but unlike them they possess no venom or silk glands. Harvestmen live by imitating spiders. It is clear from the fossil in the picture than they have never undergone any anatomical changes over the last 45 million years.